I really need to understand capitalism – thanks Karagita! Louis Dreyfus-Weidenfeld Scholar Ida Githu from Kenya writes of her experiences conducting research on water provision Karagita – supported by a Max Weidenfeld travel grant – and the uncomfortable insight it gave her into the dire economic inequality in the area. Some academics have classified slums as ‘slums of despair’ and ‘slums of hope’. Well, that was one of the things I got out of my “Cities without Slums” elective…and a classification I found to be greatly disturbing! How could someone decide that a people were without hope? The lecturer explained that the classification was based on the state of their environs and whether there was hope for a family, and consequent generations, to get out of the deplorable situation of slums. Deplorable is a word often used to refer to the state of sanitation, drainage, housing, urban planning and water access – amongst other things – in low-income urban settlements. Whilst I acknowledge the debate on the role of inequality in driving economic growth, I disagreed with the language of this classification and maintain that people are always hopeful to better their living conditions. The deplorable situation that some find themselves in is a product of factors beyond their control: social systems, regulatory practices, labour laws among others. My experience in Karagita strengthened this belief. Driven by curiosity to better understand the setting of low-income settlements – and thanks to the Max Weidenfeld Travel Grant, I set out to do my dissertation fieldwork in Karagita, a low-income urban settlement by the banks of Lake Naivasha in Kenya that is home to at least 30,000 people. The aim of my research was to evaluate whether use of a network of water kiosks, fitted with point-of-collection water defluoridation systems, is an effective and sustainable solution to safe water provision to informal settlements. With funding from the NGO Water and Sanitation for the Urban Poor (WSUP), the Naivasha water utility has sunk two boreholes that supply a network of 14 kiosks in Karagita. The kiosks sell treated and untreated water: treated water, sold at KSH 3/20L, is filtered to healthy fluoride concentrations (less than 1.5mg/L compared to the >7mg/L in Karagita’s raw water) using locally available bone char and it can then be used for cooking and drinking. The raw/untreated water, at KSH 2/20L, is for household use. Data analysis revealed that the kiosk model is an effective solution to water provision, though extra measures are needed to ensure sustainability. My research involved administering surveys and many respondents spoke of the the positive impact of the kiosk network since its implementation in 2010. Prior to the project, residents relied on donkey-cart vendors for their water needs and water costs often fluctuated, with the cheapest price being KSH 5/20L. Many noted that the kiosks were the only reliable source of water in Karagita with all respondents being dependent on kiosk water for their household water needs; a few respondents turned to other sources for water for drinking and cooking. For sustainability, however, a cheaper treatment medium should be pursued and the treatment method set-up needs to be re-evaluated to optimize for effects of flow rate on water defluoridation. In addition to collecting invaluable data for academic use, the research provided an opportunity for conversations with residents and personal observations that challenged my perspectives. Over 80% of respondents worked as casual labourers in neighbouring flower farms and the tourism industry. These flower farms around Lake Naivasha supply over 70 per cent of roses exported to Europe. Furthermore, my initial intention of conducting surveys between 10am and 2pm changed to 3pm and 6pm as I quickly learnt that Karagita is a ghost town during the day. Numerous flower farm buses offload people in their thousands between 4pm-5pm and the kiosk traffic suddenly peaks as people buy water for their evening chores. I cannot count the number of times people declined to participate in my survey because they either had a baby crying at home, had to go to cook or needed to go to wash their children’s school uniform. I found Karagita to be home to some of the most hardworking people I have ever come across. It is ironic then that whilst Karagita residents are so hardworking, the conditions under which they live are a sore representation of economic inequality. Lake Naivasha is internationally recognized as a RAMSAR site, thus a wetland of international importance. Consequently, the area has a blossoming tourism industry. With hotels occupying most of the land immediately bordering the lake, almost all the land surrounding the lake is privately owned and there is very little public access to the breath-taking view of the Lake. This also means that hotels – and to some extent flower farms – hold most of the riparian water rights, leaving the public with restricted access to lake water. Furthermore, a road separates Karagita from two of the area’s most luxurious hotels: on one side of the road is a settlement characterized by extremely poor sewerage and drainage systems whilst the other has hotels rooms in which the cheapest rate is USD 350/night for non-Kenyan residents. But perhaps the most mind boggling observation was that flower farm casual labourers are paid less than £1.50 a day, yet the cost of a bouquet of 12 red roses in Marks and Spenser is at about £30 at regular price. 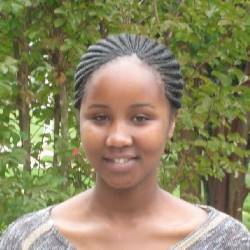 Ida completed her MSc in Water Science, Policy and Management in 2015 and has now returned to Kenya where she is working for the government of Machakos County. Ultimately she aims to work in developing more sustainable water resources for urban settlements. Comments Off on I really need to understand capitalism – thanks Karagita!